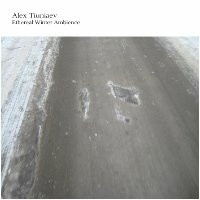 Russian prodigy Alex Tiuniaev returns to Earth Mantra with a collection of chilled but heartwarming ambient pieces entitled Ethereal Winter Ambience. In composing this work, Alex was inspired by the work of Sigur Ros and their () album, as well as Cliff Martinez's score to Soderberg's Solaris - and, of course, by Eno's 1970's ambient masterworks. The result is a quiet twilight musical journey through a winter's forest, with sights and sounds fading in and out as we pass by, a journey whose ultimate destination we can only guess at. You can feel the cold wind. The structure of the album is like a symphony with different parts arranged like an one-shot-film. Wow, this album indeed embraces its listener from the very first minute and continues to amaze. Wonderful winter music. Wow. Brilliant work. I was fascinated from the first minute of his album. Really nice melodic ambience. The piano part at the end of second track created very tender mood.